I took a twentieth century architecture class in my senior year of college. There were some outstanding architects of that era: Le Corbusier, Mies van der Rohe, Antoni Gaudi, Louis Sullivan. 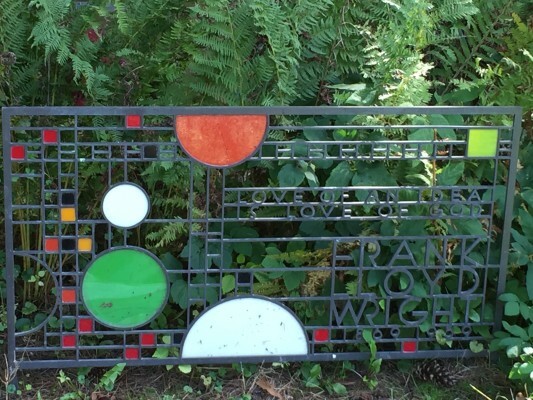 My favorite was Frank Lloyd Wright. It was then that I learned about Taliesen, his home, studio and architecture school in Spring Green, Wisconsin, and decided I must visit one day. Forty five years later, I did. Every two years, I organize a get-together of college friends. This year, I lobbied for Madison, Wisconsin, thirty five miles from Spring Green, where a tour of Taliesen would be the focal point of the weekend (in addition, of course, to great conversation, good food, and lots of laughter with dear old friends). We set out for Spring Green very early Saturday morning in splendid Indian Summer weather. We drove along two-lane country roads through wide-open pasture lands and farms, occasionally passing through tiny towns with their general stores and feed lots. It seemed there must be plenty of rainfall here as green was the primary color of the landscape. 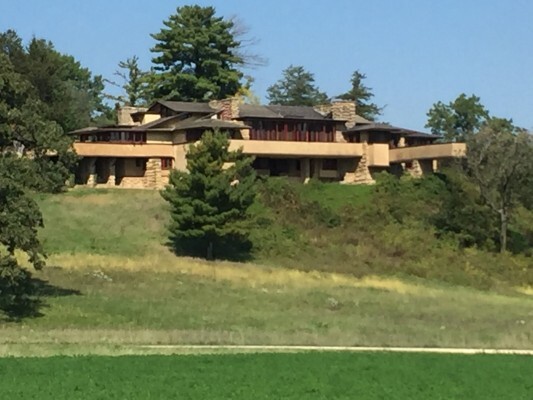 When we arrived at Taliesen, we were greeted by our guide, Margaret, a beautiful and spry seventy-eight-year-old actress who shared with us her considerable knowledge and deep love for all things FLW. Although she had been giving these tours for seventeen years, her presentation was as fresh as though we were her very first tour group. Her enthusiasm was contagious. There wasn’t a question she couldn’t answer. The four hours flew by as we visited the buildings that exemplified Wright’s meticulous design principles and his emphasis on air, light and space. We toured the School of Architecture; the dining hall with its Wright-designed furniture and lighting fixtures; the theater attached just behind it with its stage curtain representing many of his life stories; his home designed in the Prairie style for which he was so famous, every detail purposeful and beautiful to my eye. Sometimes we long to see something over a great period of time and when we finally do, we are disappointed because the experience can’t possibly live up to the anticipation. For me, this was not the case with Taliesen. I felt rewarded after waiting so many years to visit and found my expectations exceeded. As an additional pleasure, I recommend reading The Women, by T.C.Boyle and Loving Frank, by Nancy Horan.